30 Second Wine Advisor: A cupcake in a wine bottle: Why? Give a Delicious Wine Education and Save $49.95! It's perfect for Moms, Dads, Grads and Newlyweds! Each gift month from The California Wine Club includes two bottles of award-winning, limited-production California wine and a fun way to learn about wine with Uncorked magazine. Special offer: Give 4 months for the price of 3! Just $145 (includes shipping and handling, tax extra where applicable). You'll save $49.95! Click here or call 1-800-777-4443 and use Promo Code: WAGIFT. A cupcake in a wine bottle: Why? Well, hello! What's this? A red wine with an ad sheet that boasts of its "over-the-top aromas of chocolate, deep rich blackberries, red fruits ... a creamy mocha finish ... a hint of coconut ... reminiscent of a blackberry chocolate cupcake with a mocha coulis." If you've discerned my usual preferential option for dry, tart, artisanal European-style wines in the old style, well removed from the tutti-frutti blockbuster model, you may be surprised to see me pulling the cork from a bottle like this, much less devoting a column to it. But sometimes it's not just about us. Or our tastes. A few months ago, I had occasion to preside over a fund-raising tasting, well stocked with reds and whites in, well, "dry, tart, artisanal European-style wines in the old style." Quite a few of the revelers seemed quite happy with my picks, but a surprising portion surveyed the selections, asked a question or two, then asked, "These are all so harsh. Don't you have a sweet red wine?" It really made me feel bad to tell them that they were out of luck. I have addressed this topic before, in "Sweeter than wine," Sept. 25, 2006 Wine Advisor, and "Readers talk back - Sweet red wine," Sept. 27, 2006. Those discussions, though, yielded suggestions that worked as compromises at best. Could the folks at Cupcake, a California outfit that has also taken over the old Big House line of decent, modest table wines from Bonny Doon, have come up with an answer to the question that frustrated so many people at my tasting? It was worth taking one for the team just to find out. 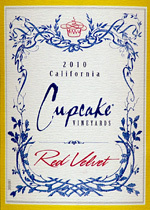 Cupcake makes about 10 varieties, but the Chardonnay named "Angelfood" and the Zin-heavy red blend called "Red Velvet" spoke most clearly to a cake-based ethos. I hit our neighborhood Walgreen's for a bottle of Cupcake Vineyards 2010 California Red Velvet, priced to sell with a real wine cork for $10.99. Red Velvet adds a little Merlot, Cabernet Sauvignon and Petite Sirah to the blend with Zin, and the wine maker's notes say they're blended after fermentation and then exposed to oak ("a unique oak regime," which for all I know signals the use of oak chips or sawdust in lieu of pricey barrels) to impart "a certain creaminess." After all this reading, it was all I could do to approach it impartially; and my friends on the WineLovers Discussion Group didn't help a lot with a snarky discussion of Red Velvet that one taster dismissed with a one-word evaluation: "Barf!" I can't honestly be that rough on it. I took a bottle to a Sunday buffet dinner and shared it with the group, most of whom were quite willing to finish their glasses. Somewhat to my surprise, I didn't get any chocolate cake vibes out of it at all, and indeed judged it only marginally sweet, with a good but not crazy cherry-berry character and decent acidity to offset its fresh-fruit sweetness: It's no adult soda pop. Although the name and marketing spin lead the consumer to expect something as sweet and luscious as chocolate cake, that's not happening here. It's actually a passable red wine in the least-common-denominator style that you'll find for a fraction of the price in Trader Joe's Charles Shaw ("Two Buck Chuck") line. But to be honest, it doesn't rise to the level of interest that most wine enthusiasts will demand for the price, and I'm afraid it will disappoint those who come to it expecting a chocolate cupcake in a wine glass. This wine seems to be looking for an unserved market niche, but I'm not sure it's finding it. It wouldn't surprise me, frankly, to see this brand disappear after it exhausts the population of people who really want a sweet, drinkable, affordable red and fail to find it here. You'll find my detailed tasting notes below. Each gift month from The California Wine Club includes two bottles of award-winning, limited-production California wine and a fun way to learn about wine with Uncorked magazine. Uncorked takes readers inside the featured winery and is filled with easy-to-read wine facts, tasting notes, wine tips, recipes, wine country insight and more! It's a tasty lesson in wine that cannot be found in stores. Special offer: Give 4 months for the price of 3! Just $145 (includes shipping and handling, tax extra where applicable). You'll save $49.95! Click here or call 1-800-777-4443 and use Promo Code: WAGIFT when ordering. Send as many months as you wish and save even more on gifts of 6, 9 and 12 months! FOOD MATCH: Its failure to achieve cupcake-emulation status actually serves it well enough for the purpose to which I put it, a party beverage on a Sunday buffet at the home of friends. No complaints about its service with finger fare as varied as deviled eggs, sweet pickles and cheese. It would probably go okay with a burger or pizza, as well as serving what may well be its intended purpose, sipping alone as a cocktail drink. VALUE: As noted in today's article, it's problematic in that its apparent intended audience of people who don't care for dry wines can find alternatives ("Two Buck Chuck") for less, while enthusiasts willing to spend over $10 for a bottle may not find it interesting enough to justify the toll. Wine-Searcher.com turns up many vendors offering it for well under $10. Here's the winery's ad sheet and wine maker's tasting notes on Red Velvet. I wasn't kidding about finding this wine at Walgreen's, which may be your easiest route to buy it if you want it. You'll find dozens of vendors, too, most at prices well below my local pharmacy, on Wine-Searcher.com.